Severe winds– High winds can blow shingles off the roof, leaving the structure of your home exposed. 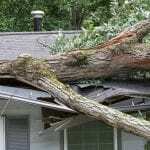 Large objects, such as tree limbs, could also be blown onto the roof, misshaping it or creating holes. Heavy rain– After a big rainfall, shingles could become saturated and any gaps or worn places could allow leaking into your home. Hail- Hail can be large and heavy, but even smaller hail can cause damage to the appearance of your roof and can also cause structural damage that leads to more serious problems. Unprecedented snowfall– If there are several inches of snow sitting on your roof, it can become heavy and lead to warping. Also, when the snow starts to melt, it could mean excessive moisture damaging the shingles and/or structure of the roof. 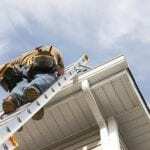 Any of these situations could result in storm damage to your roof that needs immediate attention. It’s important to get any storm damage taken care of as soon after an incident as possible, so reach out to us if you need help!